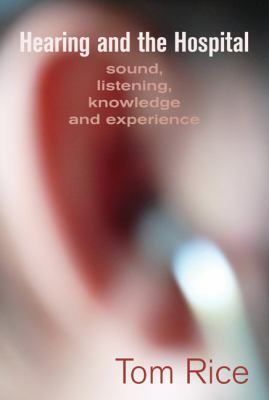 An original ethnography of sound and listening in one of our major institutions, Hearing and the Hospital reveals the hospital to be a space in which several modes of listening are simultaneously in play and in which different layers of auditory knowledge and experience coexist. Engaging with Sound Studies, the Anthropology of the Senses, Medical Anthropology and Science and Technology Studies in this volume, Tom Rice shows how sound and listening produce, articulate and mediate social relations inside the hospital; how listening acquires direction and focus within that environment; and how certain sounds become endowed with particular meanings and associations. He also exposes many of the sensory minutiae that both underpin and undermine the production of medical knowledge and skill. Hearing and the Hospital creates an acoustic interrogation of hospital life, and in doing so questions accepted ideas about the sense of hearing itself. There's a great deal to admire in Tom Rice's ethnography of the aural politics of the hospital. First because it represents a unique conjunction of the ethnography of sound and senses with medical anthropology and social studies of science. Next because it patiently details how sound as a way of knowing so deeply informs social practices of medical listening. And finally because it is so successful in revealing both how hospitals and bodies pulse as acoustic spaces, and how patients and doctors professionalize, personalize, and participate as situated listeners. (Steven Feld, Distinguished Professor of Anthropology and Music, University of New Mexico). Tom Rice is Lecturer in Anthropology at the University of Exeter, and specializes in auditory culture. As well as writing and teaching on sound he has produced audio pieces including the BBC Radio 4 feature The Art of Water Music.